-Arcane Inheritor: Cast a 1st level sorc/wiz spell 1/day at 11+cha-mod DC. -Deep Sight: Low-light vision as long as underwater and the ability to see through murky and opaque water. Nice! -Sunken Legacy: For Hybrids, count as both gillman and human, choose an attribute that then gains +1 on related attribute & skill-checks. -Eldritch Obsession: Gain UMD as class skills and +5 to blindly activate items. -Terrestrial Curiosity: Survive twice as long snas water immersion. Nice for player characters. -Deep Thrall: + to fort saves, but be susceptible to enchantment. -Muckdweller: Slower swim-and land-speed, but you’re not water-dependant. -Pass for Human: Be more easily disguised as human (bonus feat), but have your aboleth-ties weakened, for better and worse. We also get a new archetype, the Deep Dreamer, which is a summoner archetype that has the summoner seeking to recreate the shape glimpsed in dreams via their eidolon and thus are resistant to dream-related spells. At higher levels, they may take evolution-points from their eidolon to increases their own physis and become potentially rather frightening. A cool and imaginative archetype! Editing and formatting are excellent, I didn’t notice any glitches. Layout adheres to Abandoned Art’s 2-column standard and the pdf has no bookmarks, but needs none at this length. 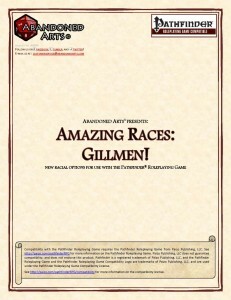 This is so far my favorite installment of the Amazing Race-series, offering cool options in line with the Innsmouth-flair and cthulhoid connotations associated with gillmen. Add the excellent summoner-archetype and we get a great addition that makes the race work better as an adventuring race – my final verdict thus clocks in at 5 stars + seal of approval. Claim your dark legacy here!